What makes a true classics rider? The answer is not straightforward as you might expect, and every rider (and coach) has their own view on what it takes. Not everyone follows the same path, and both targets and training will vary from rider to rider. We are very fortunate to have Mathew Hayman’s insights into how he approached the classics throughout his career to become a one-day specialist. We also have a wealth of information from many years of his Training Peaks data along with the perspective of his coach, Kevin Poulton, during the final four years of his career. To start off part two of Mathew’s career analysis we asked Kevin and Mathew what they thought were the major attributes a rider needs to compete and win the hardest one-day races in the world. Mathew Hayman: To ride the classics well you need to be very motivated… As a rider you need to be fighting for important turns and climbs for 5-6hrs, and the weather can often be a challenge as well. All this is very draining mentally, on top of the physical stress. It requires 5-6hrs of concentration, and a level of aggression—you also need to be able to absorb a lot of negative thoughts, as things don’t always go how you would like in a Classic. Personally, I feel I can go very deep on one day. If I am fresh, I seem to be able to empty my body of all its energy in one race. Kevin Poulton: If I had to choose one area, I would place more emphasis on aerobic engine. The more developed and efficient the aerobic engine, the better the athlete will recover. But this is also the reason that riders gradually fall off the pace in the classics. Most riders can produce very similar high anaerobic power efforts across their power-duration curve. Everyone can do their best peak powers in the first hour of racing. But to produce this high power after 4 or 5 hours of racing requires a well-developed aerobic engine. The riders that are less aerobically efficient are depleting their ability to produce high power at a faster rate than those with the more developed aerobic engine. In part 2 of our review of Mathew Hayman’s career we are going to take an in-depth look at the buildup to two of his most successful spring seasons. In 2011 Mathew Hayman was in his second season with the newly-formed Team Sky. He landed on the podium in both Omloop Het Nieuwsblad at the start of February, and Dwars Door Vlaanderen in March—along with a promising 10th place in Paris Roubaix, his best-ever finish at the Hell of the North up to this point. The build up to this season started with a long training block in his native Australia from December through to late January. He used the Tour Down Under in January to hone his early-season condition. This was followed by another stage race in the Tour of Oman in February and then Tirreno-Adriatico in March. We looked at the specifics of his build up from December through the end of February to find out how he managed to hit the spring with such good form. During December much of the focus was on building Strength Endurance, which is defined as “a specific form of strength displayed in activities which require a relatively long duration of muscle tension with minimal decrease in efficiency” i.e. cycling. Much of this type of training is done at a low cadence (<65rpm) for durations lasting between 5-15min at an intensity below threshold. Mathew also used local criterium racing for some early high intensity, and longer endurance rides to build his aerobic engine. Intensity was gradually increased as he progressed to higher tempo and threshold sessions; and his endurance rides got longer. In Early January, Mathew continued to combine the local criteriums in Australia with longer endurance rides to develop his aerobic base and his high intensity tolerance. This was part of his build up to both the Australian national road championships and his preparation for the Tour Down Under. The TDU placed a high stress load on Mathew early in his spring preparation needs. His CTL starting the TDU was at 127 and by the end of the race on the it was 140, this was a 13 CTL ramp over the 6 stages. In order to maximize fitness gains, it was important to recover adequately before moving on to the next preparation phase. After Mathew had recovered from the TDU, February included a step up to higher intensity work. At this point, one of the main requirements in his training was to work on his tolerance for hard effort with intensities near or above his Vo2max, and longer Threshold efforts at variable intensities (Over-Unders). The early February training was part of the final build in fitness prior to the next stage race of the year, the Tour of Oman. Tour of Oman – CTL start at 141 and end at 151 with a -31TSB, ramp of 10 TSS points over 6 days. This fitness was topped up with a very intensive Tirreno-Adriatico. At the end of the 7th stage on the 14th of March, he hit his peak CTL of 157. We know this was a very hard race as Hayman experienced a 20 point ramp in his CTL over the 7 stages. He also finished this stage race with a -57 TSB, his lowest TSB of the entire build up to the Classics. The build and recovery must have worked; the month cumulated in a successful outing in Belgium with fantastic 3rd place in Omloop Het Nieuwsblad and another podium at Dwars Door Vllaandern. Add a 10th place in Roubaix you can see that Mathew’s consistent pre-season preparation allowed him to hit the early season cobbled races in great condition. Stephen Gallagher: Did you feel the heavy end of season in 2015 helped you towards a good early season in 2016? (Mathew had 33 days of racing between Aug-Oct 15’). MH: I think that we have seen it in the past and will see it in the future that the Tour of Spain is a good race for the Classics specialist. If you are aiming for the World Championships then you have a great block, but more importantly, the work you do there puts you in a good position to start the training for the following season in great shape… that follows through to the classics. SG: Prior to the 2016 Paris Roubaix win, you suffered an injury that kept you out of early season racing. Did you feel that not having the traditional Paris-Nice or Tirreno-Adriatico in the legs helped you in hindsight? MH: Up until two weeks before Paris Roubaix I was not sure that I was going to be riding, to be honest. I really had to lobby the team to let me race two one-day races in Spain (the weekend before Paris-Roubaix) as they didn’t think I was ready to start Flanders. 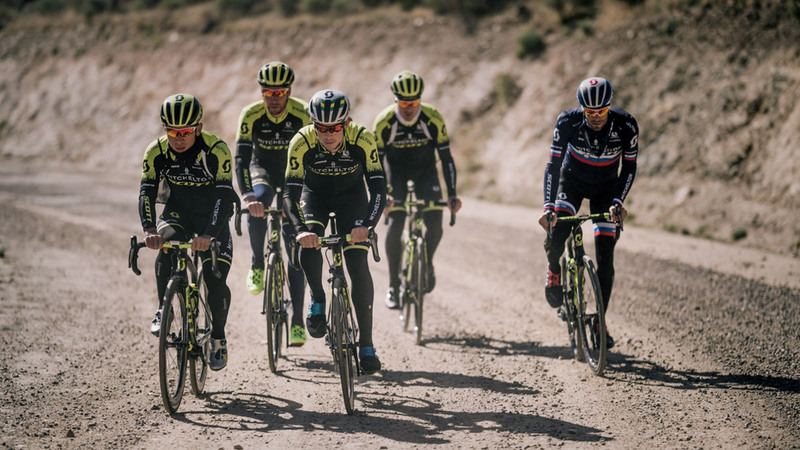 Following those races, I was able to train with the boys on the cobbles the Wednesday before Roubaix; I felt really good in that training and put out some good numbers. It was then that I knew I could line up. In that training and the race itself I felt fresh, heart rate was going up easily, I also really excited to be there. Some of the boys get a little battle-weary by the time Roubaix comes around each year. I was just happy and excited to be back racing, happy to help the boys, be in my favorite race of the year. Nothing more. When you have missed all the Classics and preparation races, you don’t start with any real ambition. Wasn’t ‘till the race unfolded that I started to believe that I could go the distance and possibl have a good ride. As we heard from Mathew, he finished the 2015 season with a very heavy race program, leaving him with 33 days of racing in the last few months of the season finishing in October. As such, his CTL was probably significantly higher coming into the 2016 season than it may have been had he not had such an intensive end to the 2015 season. By the beginning of December, Mathew had already finished up a very early training camp in the Mountains of Australia with his teammates. One of the big differences between 2010 and 2015 was the more strategic approach to intensity—rather than competing in local criteriums, Mathew focused more on targeted power levels at predefined cadences. Again he did strength endurance workouts, often in conjunction with tempo riding. He also had a sprinkling of higher intensity work for short durations. Most of his sessions were very difficult; he was combining the significant muscular fatigue of riding at tempo with low cadences with riding 10-20min blocks at 90% of FTHR (“Threshold Heart Rate”). His TSS scores were similar to 2010-2011 but we see more targeted spikes in intensity above threshold combined with Tempo work. Mathew started December with a CTL of 103 and ended in with a CTL of 135, a 32 CTL ramp during the month of December. The Tour Down Under was once again a staple of Mathew’s early season prep. The stage race, along with the National Championships (first weekend of January), and the Cadel Evans Great Ocean Road Race at the end of January made up a solid early-season racing block. This month would have been a juggling act between being fresh enough to be competitive for the Australian summer racing while maintaining enough training stress to keep pushing the fitness upwards. Mathew’s CTL starting the TDU was at 130 and by the end of the race on the it was 141; an 11 CTL ramp over the 6 stages. We can see from the 3 months between December 2015 and February 2016 that the December training block gave Mathew his highest TSS score. While training load gradually decreased over the coming months, intensity in training and via racing were obviously increased both by nature of his workouts and external stressors like altitude. As he mentioned above, February was dominated by an altitude training camp in South Africa, which provided a significant fitness bump. The initial few days of the camp were ridden at a relatively low intensity to support adaption to the high altitude, followed by some higher threshold training with team race simulations at or above threshold. Mathew also rode various longer climbs to improve his aerobic capacity, and did multiple long endurance rides in this massive 16-day block prior to his return to Europe. Unfortunately, the consistency in his training came to an abrupt end when he crashed in Omloop Het Nieuwsblad, breaking his wrist. CTL at end of SA camp (20th Feb) 143 CTL – a 12 CTL ramp over the two weeks in South Africa. Training at Altitude in South Africa in February. A big training block. The critical build-up to Mathew’s Spring Classic campaign was critically interrupted by the injury, and his participation in Paris-Roubaix looked unlikely in the weeks after his crash. His coach Kevin Poulton had to do some strategic planning to get Mathew into a condition to be even considered by his team to ride the Hell of the North. We asked Kevin about how he dealt with the process leading up to Roubaix as he was restricted in his training due to a broken wrist. SG: When Mat broke his wrist and you were restricted to the turbo, what was the focus within his sessions? KP: Initially we used Zwift to maintain the very good level of fitness that Mat had built prior to his crash. The aim was simply to reach a specific amount of volume, but it soon became clear that we were making significant gains with the Zwift training. From here the training focused on replicating the many surges that occur when riding the cobbled sectors. From analyzing the Mat’s past Roubaix race files, we knew that he needed to produce high intensity surges (above threshold) of roughly 20sec to 1min. But these surges also needed to be performed from an already high tempo, near threshold effort. Leading into Roubaix the go-to session was 20min tempo-type efforts with 20-second surges every two minutes. The day before Roubaix, we had a pre-race session consisting of (among other things) a few 5-10sec max sprints. Mat would always do his best 10-second sprint of the year the day before Roubaix! Example of the indoor workouts done in preparation for Paris-Roubaix. This was no half-hearted effort; Mathew had to spend nearly 20 hours per week on the turbo to get back up to speed. In the initial days after breaking his wrist, Mathew’s CTL sank to 116 with a +52 TSB. But with his dedication and willingness to put in the hard yards indoors, Mathew raised his CTL to 126 by the April 2nd—a 10 CTL point ramp over a 4-week period. He completed a total of 56 hours of training in March, for a total TSS score of 2659. By the time Paris Roubaix came around, Mathew had a CTL of 131 with TSB of +3. His CTL in 2011 for Paris Roubaix was 145. Even with a major crash and lacking the traditional March stage race, Mathew was only 14 CTL points below previous years. Ultimately, despite the lack of racing he had done leading up to the day, Mathew and Kevin’s strategy paid off: Mathew went on to win Paris-Roubaix in 2016. (See the file and analysis here). With very strategic sessions replicating the demands of the cobbles, and the dedication necessary to maintain the conditioning he had built before Omloop Het Nieuwsblad, he was able to have a fantastic, career-defining race. It has been amazing to see the work and effort needed to be a world-leading cyclist and classics winner. Rarely are we able to see so many years of progress—along with different trends in training and racing. A tremendous thank you to Mathew for sharing an unprecedented amount of data with us, and well done on a remarkable career!